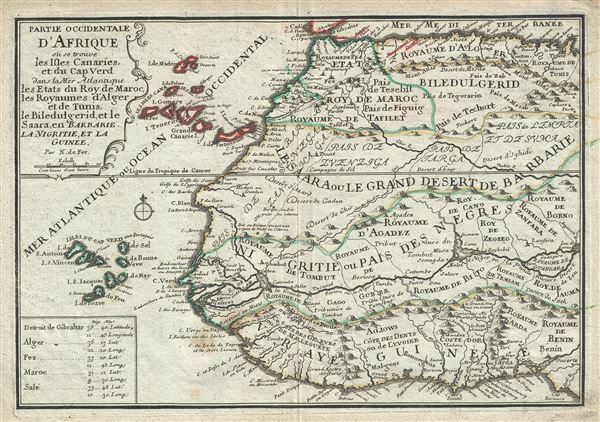 Partie Occidentale D'Afrique ou se trouve les Isles Canaries, et du Cap Ver dans la Mer Atlantique les Etats du Roy de Maroc, des Royaumes d'Alger et de Tunis, de Biledulgerid, et le Saara, en Barbarie, La Nigritie, et la Guinee. This is a scarce 1701 map of western Africa by Nicholas De Fer. It covers the northwestern part of Africa from the Mediterranean Sea to the Gulf of Guinea and the Bight of Benin, and from the Cape Verde Islands eastward as far as Tunis. The Cape Verde Islands and the Canary Islands are also included. The whole offers extensive detail on the tribes and kingdoms of central and West Africa, including the Kingdoms of Fez, Tunis, Benin, and others. The map renders the entire region in extraordinary detail offering both topographical and political information with mountains beautifully rendered in profile. The inland course of the Niger River, a matter that was being actively debated in Europe at the time, is mostly speculative beyond a certain point. De Fer's curiously maps the Niger River which includes a great lake, called Lac de Guarde or Lac de Sigismes formed by the Niger – an embryonic attempt to map the important and unusual Niger Inland Delta. The river, moreover, runs directly eastward rather than correctly to the northeast.
. The lower left quadrant includes a table noting the geographical position of important cities. This map was created by Nicholas De Fer for his 1701 Atlas. Very good. Minor wear along original centerfold. Minor spotting at places. Original platemark visible.